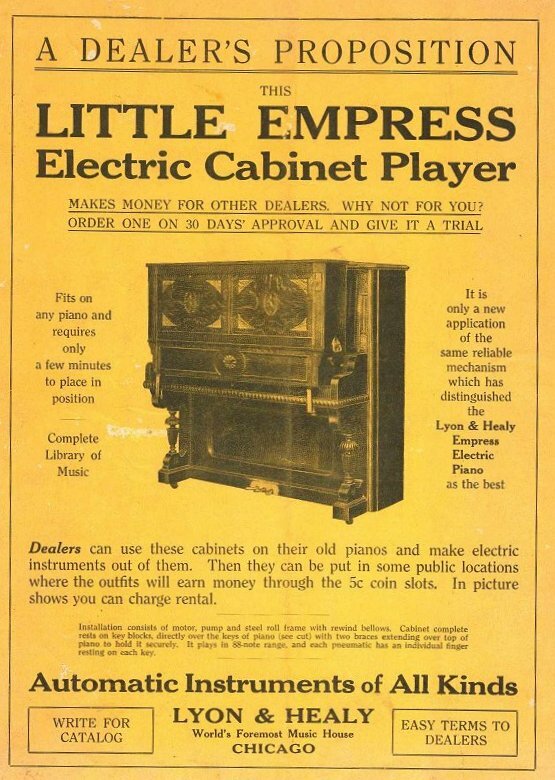 "Little Empress Electric Cabinet Player"
The advertisement shown in this picture comprises the entire rear cover of the 1916-1917 Lyon & Healy catalog. Compare the illustration with the essentially similar Coinola Cabinet Player shown in the lower left corner of the Coinola color poster. The cabinet containing the pneumatic player system was carefully attached above the keyboard of an ordinary piano. Much smaller units to play ordinary pianos were produced in the 1950s and '60s, and the generic term became "keytop player". The market for these bulky devices was never very big -- push-up players (including the German Vorsetzer) and keytop players were bulky and funny looking in comparison to the sleek Pianola with the mechanism housed within the piano case.